Rabbits are grass-eaters in the wild so a pet rabbit should get 95% good quality hay, supplemented by a couple of egg-cups full of complete pellet food like e.g. Excel rabbit food. You can give vegetables as treats but too much vegetables will make the rabbit overweight, which is not good for the gut-system. My rabbit is not eating - What can I do? If a rabbit is not eating, there is often an underlaying problem like dental problems, pain, gut stasis (when the guts stop moving) or stress. A rabbit which is not eating should be checked over by a vet. How old can my rabbit get? 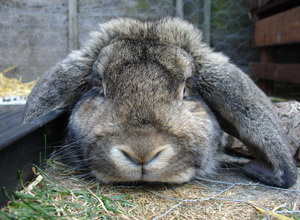 The average life-span of a well kept rabbit is six to eight years. Can I house a rabbit and a guinea pig together? In theory yes, as long as you supplement the food with vitamin C for the guinea pig. They can't make vitamin C themselves, so it needs to be supplemented in the diet. Added vitamin C is not harmful for the rabbit. Occasionally rabbits can bully guinea pigs, and if so they need to be separated. How old can my rat get? Most rats have a life span of about two years. They are prone to tumours and chest infections and are not long lived animals. I would like to buy a small pet for my kids. What should I get? Hamsters are not very suitable pets for kids. They sleep all day and are awake all night and are usually grumpy if they are woken up during their sleep. 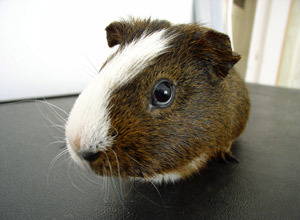 Guinea pigs and rats are good pets for kids to handle (with an adult present) and take care of. Rabbits are a little more difficult to care for. All small pets should be a part of the family and you need to make sure that you know about the requirements of the pet before you purchase one.